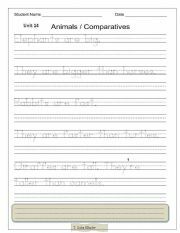 Hello colleagues all over the world, This worksheet is an animals comparative worksheet that focuses on some animals and comparing them using one-syllable adjectives for young learners to practise handwriting. I have just uploaded this one on busy teachers.com Simple, but hope you find it useful! 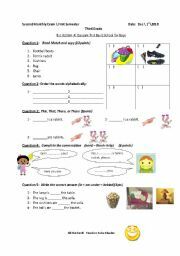 This is a handwriting worksheet for the students in the early elementary stage of the English language, as to help them write easily and correctly. 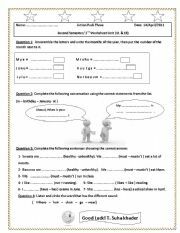 This worksheet is a kind of practice of spelling numbers for pupils. This lesson is concentrating on numbers using keys of thinking. It�s very useful for our students to let them think in different ways.. This plan has got various tasks regarding the keys.. This is a plan for teachers of English as a foreign language. The lesson is taken from the Action Pack grade two in Jordan. 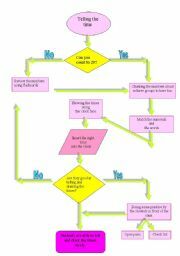 This plan shows us how teacher starts and goes through the lesson the how to end it.I don�t know the exact term in English. But I can say it�s a kind of operational strategical teaching plan. This is a web quest for students in the third grade who are learning telling the times in halves and quarters. It is really a very good choice to change the ordinary role of students to search and explore different resources via the internet depending on themselves writing, listening and speaking freely. This is a plan for for the 3rd grade about numbers.. This is an exam for grade 3 consisting of different skills. Hope you like it and find it useful. It�s very clear that brain storming and mind map are used in this lesson. Brain storming is one of the most important strategies that is very beneficial to students to let them think and express themselves freely. This lesson is about city landmarks in which I use the web walk as a way to let students depend on themselves to build their learning process. A lesson Plan done on six thinking hats, which is very useful to our students during all levels as to develop their thinking abilities in life and discover things around carefully. So, let�s make our students think in parallel.. This quiz has been created in order to let pupils practise the present progressive simply with yes, no questions. A listening exercise has been added to distinguish between different diphthongs. 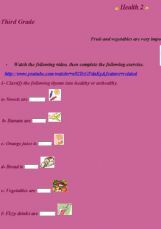 This online exercise is created to help students at the elemntary level, who are learning healthy and unhlealthy food items, to defferentiate between both healthy(good) and (bad)unhealthy food.